As far as I’m concerned, the best – and quite possibly the only way to time travel is to cook. Reading gets us only partway there – we dream ourselves into other times, other lands. But they remain just that – dreams. Visiting ruins gets us a little closer. But, at the end of the day, ruins are simply ruins – fragments of the splendor that what once was. 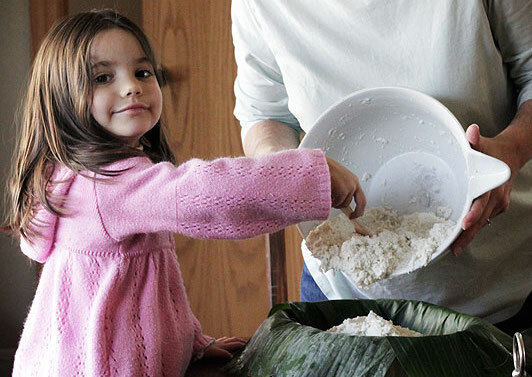 But, when it comes to cooking food from ancient times? Instant time travel. In my mouth. When I cook I am potentially eating exactly what someone long ago ate. I can shut my eyes and focus in on the beautiful flavors of that time and place. I might as well be there. 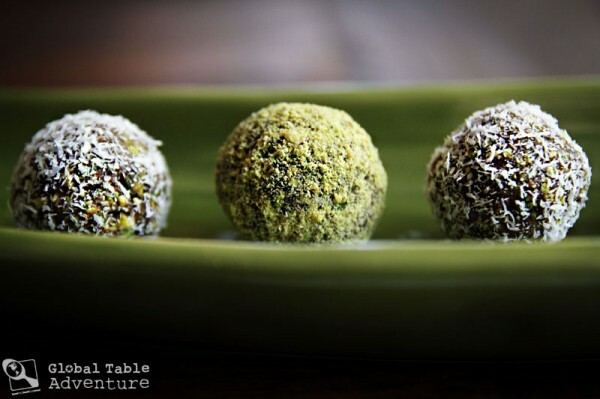 Introducing date balls. One of the world’s earliest treats. Fit enough for a king. The most amazing thing about Date Balls is exactly how long they’ve been around. You’ll find them in Iraq today, but you also would have found them in ancient Babylon, when they were called Mersu. At least, that’s what the Yale Tablets say. Making them is simple. There’s nothing to it. You just need a food processor or a knife and loads of patience. 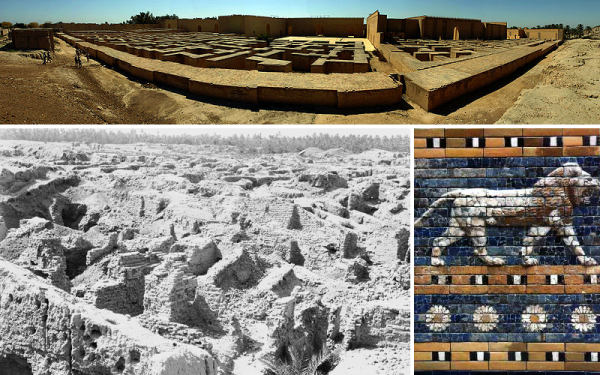 Top: The rebuilt ruins of Babylon, as seen today | Bottom Left: Ruins as they stood in 1932 Right: Part of the reconstructed Ishtar Gate. 1. 2. 3…. now, take a deep breath and fly back in time. But, for the sake of convenience, let’s take our food processor with us. We begin our journey by blending dates into a paste, then add the pistachios. Pulse until a coarse mixture forms. It’ll ball up when you press the sweet goodness with your fingers. Form into small balls. I leveled the mixture in a tablespoon to make sure they all came out the same, then I rolled them in my hands. About half way through I washed my hands and the spoon to reduce stickiness. This made a dozen. 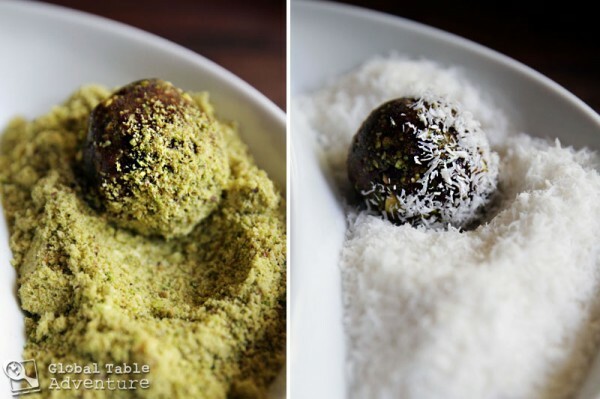 As a finishing touch, roll the date balls in ground pistachios or shredded coconut. The pistachios coating is more traditional, although the coconut is fun. 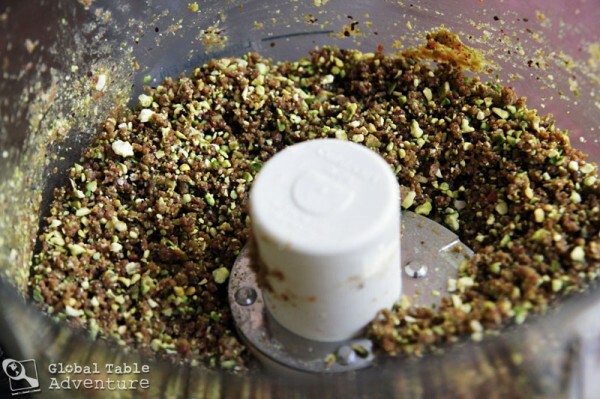 (make ground pistachios by pulsing a 1/4 cup in a coffee grinder or food processor. Since I’m never good at choosing, I did both. And it was wonderful. These are definitely going on the table at my next gathering, when we’ll all fly back in time together. 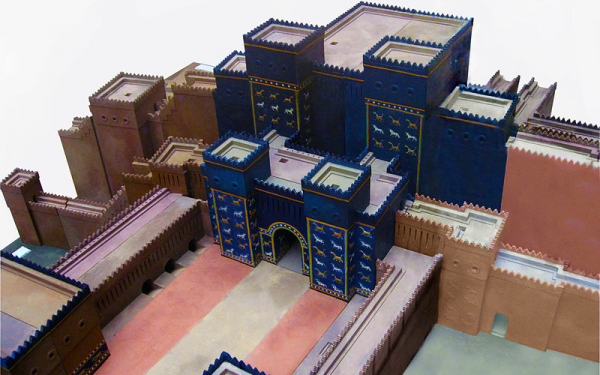 And, just possibly, walking up to the Ishtar Gate, headed to a party with lots of Pistachio Date Balls. While we can only dream about what it would look like, we know it would taste delicious. The most amazing thing about Date Balls is exactly how long they’ve been around. You’ll find them in Iraq today, but you also would have found them in ancient Babylon, when they were called Mersu. At least, that’s what the Yale Tablets say. Making them is simple. There’s nothing to it. You just need a food processor or a knife. 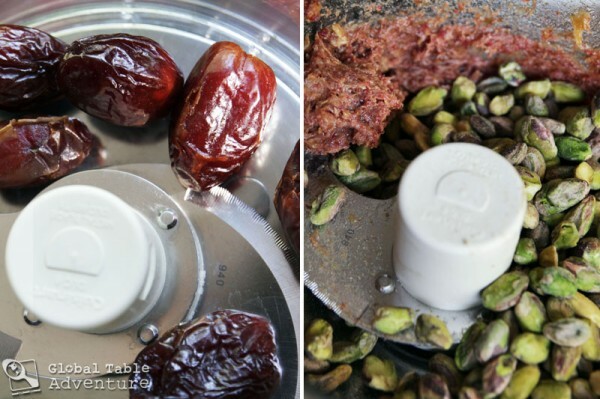 In a food processor blend the dates into a paste. Add pistachios. Stores in an airtight container for several weeks. I’ve had these date balls before but never made them myself. Thank you for giving me another reason to let go of my. . . whatever I have blocking me and go out and buy a food processor. Do you recommend one processor over another? I don’t want to spend a lot of money. Time travel with food works brilliantly for non food-obsessed people as well, it really does. 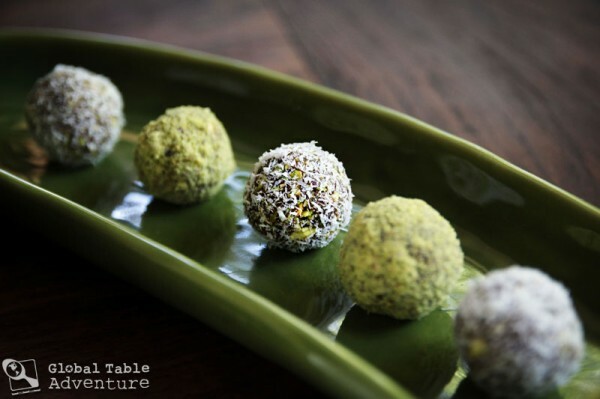 Laura Kelley’s Mesopotamian challenge had my partner jumping up and down with excitement, and he can’t wait to try some very very old food, including these little balls. Yummmm…this is a variation on Russian Tea “Cakes” cooked, and then rolled in powdered sugar. I like what you said about time travel. It reminded me very much of Proust. It is also how the Chinese view art and calligraphy. When they look at a drawing made 800 years ago, they try to recreate in their mind the motions the artist made with his hand and arm to create it, and by so doing capture the feelings of a man who lived 8 centuries before. Agree that food processing beats a half an hour of pounding and rolling – which is how the ancients would have gone about making mersu and hoe many people without modern conveniences go about it today! Would you like to submit this for the Mesopotamian Cookoff? If yes, will you write it up separately, or just have me link to your post? Your choice. 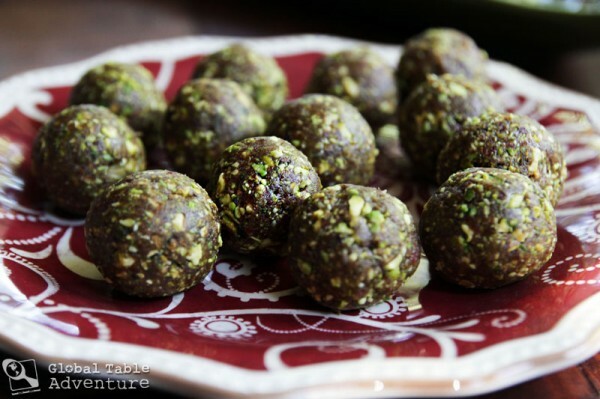 To anyone else out there who wants to enter, with a great deal of respect, Sasha’s confection is just one possible creation made of dates and pistachios. Many more possibilities are out there and waiting to be tried. 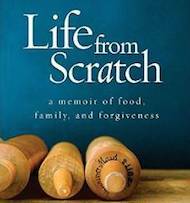 Like Sasha’s version still eaten in Iraq today, some of the others are still on the modern table in Iran, Lebanon and Egypt. Congrats Sasha! 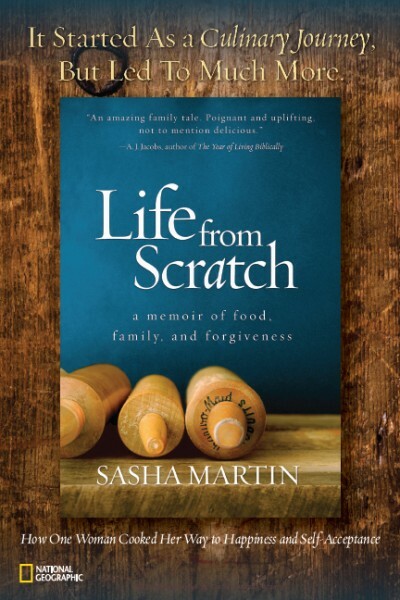 Forgive me for intruding but even if Sasha writes it up separately, you should include a link to her blog because she has not yet achieved the recognition that her great work deserves. Great pictures, beautiful writing, and awesome blog… I really enjoy reading your posts! @Jessica & Collette – Good planners. I cracked up thinking about the extra long extension cord! @Caffeteria – looking forward to hearing about what you decide on! @Mom – I was surprised how sweet, but not cloying it is. A healthy treat. @Brian – Thanks and thanks! Love the thoughts about Chinese art and calligraphy. @ Laura – Thank you – it was fun to make and surprisingly good (this is not something I would normally try) – I’ll write a short something up for you. I just love the concept of your cookoff and am glad it worked out for me to participate. @ homegrown country girl – I appreciate it and am so glad! Thanks for reading and cooking. Have a great day! I tried these, but my date/pistachio ratio seemed way off with a cup of each. I kept adding dates, but when I gave up they were still a bit dry. Maybe it was because my pistachios were pieces, not whole and measured up more densely. Was your ratio really 1:1 dates to pistachios? Your pictures look so sticky and date-full. which are basically the same prep, only you add in the almonds and coconut in before rolling up and I loved them. Hmm, the first picture shows exactly how many dates to pistachios I used…They were not overly sticky – just enough to press into a ball and for a little of the outer stuff to stick to it. I think you are right about the measurement: whole vs pieces could make a big difference. Also – fresher is more moist – and even the weather/humidity in the air can affect our cooking. I see Larabars have ancient roots! Who knew! According to my husband, those were very delicious. I still battle cold so I have no clue how they taste, but it didn’t stop me from eating:) I’ll definitely make them again. I made these, and they WERE yum! Thank You for posting this delicious recipe! 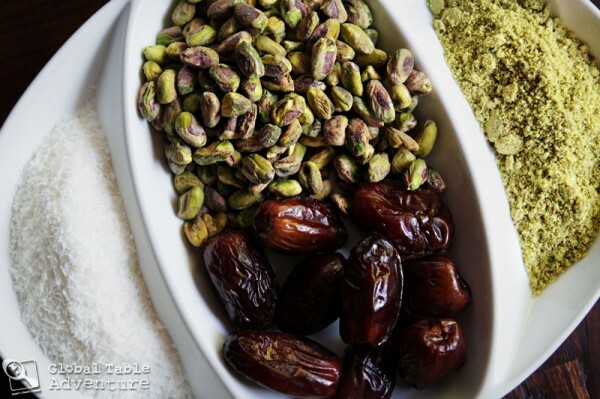 You can also add 1/4 teaspoon ground cardamom which adds so much to the date and pistachios.